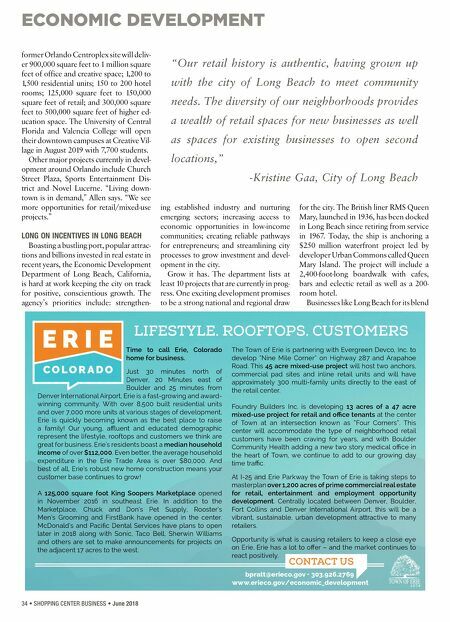 ECONOMIC DEVELOPMENT June 2018 • SHOPPING CENTER BUSINESS • 35 of big-city and beach vibe, its proximity to L.A. and Orange County markets, its strong sustainable urban development initiatives — including a commitment to using 100 percent renewable energy and a long-term plan for zero waste. It's also home to unique amenities, activities and events as well as its active port, which is the second busiest in the United States processing more than 6 million contain- ers and supporting 300,000 regional jobs. "Retail is a vital part of this city because it helps ground and identify each unique community," says the Economic Develop- ment Department's Kristine Gaa. "Our retail history is authentic, having grown up with the city of Long Beach to meet community needs. The diversity of our neighborhoods provides a wealth of retail spaces for new businesses as well as spac- es for existing businesses to open second locations." Gaa adds that the city is currently look- ing to help developers successfully lease with curated retail tenants. "The success of our developers to secure tenancy only enriches our community and the retail of- ferings for our residents." Several areas where there are opportuni- ties for development include downtown, midtown spanning the major arterial of Long Beach Boulevard and the Uptown Business District in North Long Beach. APPLE VALLEY SPREADS ITS ROOTS The sunny town of Apple Valley, Cal- ifornia, is touted as this area's preferred retail destination. In North Apple Valley, a Big Lots Distribution Center is under construction. The 1.3 million square foot facility will be the largest in the High Desert — a name given to this region of the Mojave Desert where cities claim an elevation between 2,000 and 4,000 feet. In the past year, Yucca Loma Bridge opened, which Economic Development Manager Orlando Acevedo says is paving the way for future development opportu- nities. The bridge opens access to Spring Valley Lake and provides an additional east-west regional corridor. Apple Valley's first freeway-frontage commercial center was recently entitled at the northeast corner of Interstate 15 and Dale Evans Parkway. Leasing is un- derway for the 10-acre, 80,480-square- foot center to include retail, restaurants, a fuel station and hotel. The local economy is driven by 4.2 mil- lion square feet of retail and office space and 2.6 million square feet of industrial inventory and available large-acre sites. "Data indicates, and our residents ex- C O L O R A D O 303.926.2769 www.erieco.gov/economic_development Ben Pratt | bpratt@erieco.gov CON TAC T US L I F E S T Y L E . R O O F T O P S . CUSTOMERS. Time to call Erie, Colorado home for business. 3 retail centers under development Educated: 59% of Erie residents are college graduates Median age 37 $112,000 average household income. Population of 25,000 . 450+ new residential units added in each of last 3 years Corte Bella, a new multifamily development in Bellflower, California.